Iconic luxury watchmaker Girard-Perregaux and Asia Society Southern California (ASSC) partnered up last night in at the Millennium Biltmore Hotel to honor legendary basketball personality Yao Ming at its 2013 Annual Gala. Yao Ming is an eight-time All-Star center with the Houston Rockets and played on three PRC Olympic basketball teams. He is a veritable Ambassador of the sport on behalf of China. In 2011, Yao became the founder and proprietor of Yao Family Wines, which brings to China and the world one of the finest Cabernets from Napa Valley. He is also a giant in the philanthropic world not only through his Foundation but also through partnering with the Special Olympics and WildAid in its quest to prevent the eradication of sharks and African elephants. Yao Ming was the recipient of the Asia Society's "Visionary of the Year" award, which Girard-Perregaux is honoring by presenting him with a “Yao Ming” Chrono Hawk timepiece during the evening. The watch features a Manufacture chronograph automatic movement housed in a 44 mm stainless steel case. This special timepiece also features Yao Ming’s special symbol embossed in vivid red on the rubber strap and transferred on the sapphire caseback. Girard-Perregaux only created two watches of this design: one to honor Yao Ming and the second, which was later on auctioned during the evening for $16,000. We are very proud to honor such an iconic basketball star as Yao Ming”, said Jean-Marc Bories, International sales Director for Girard-Perregaux. “Not only does he represent the best in the sport of basketball, but he also represents the best of humanity, through his important work with the Special Olympics and WildAid”. 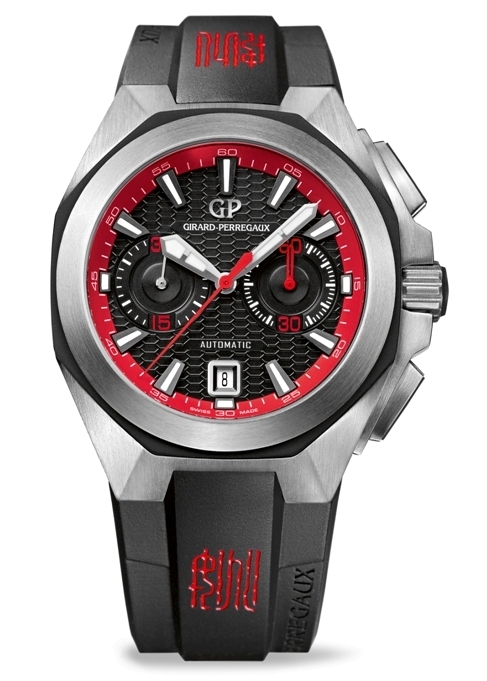 In addition to the above, Girard-Perregaux presented a Girard-Perregaux 1966 full calendar to another basketball icon, Steve Nash, for his strong philanthropic work through the Steve Nash Foundation, which dedicates itself to providing underserved children with fundamentals for their health and education. In addition, ASSC also presented the 2013 “Asian American Leader of the Year” award to John Chiang, California State Controller, for his strong leadership and stewardship in supporting the State of California. As the State’s chief fiscal officer, John Chiang brings extensive experience and fiscal leadership to the State Controller’s Office. Chiang was first elected to the Board of Equalization in 1998 where he served two terms, including three years as chair. He began his career as a tax law specialist with the Internal Revenue Service and previously served as an attorney in the State Controller’s Office. The son of immigrant parents, Chiang graduated with honors from the University of South Florida with a degree in Finance. He received his law degree from the Georgetown University Law Center. Chiang and his wife, Terry Chi, live in Torrance, California.